How many of you are READY FOR SPRING??? It’s been a rough winter for most of us, that’s for sure! As you know, one of my most favorite vegetables/fruits to grow is TOMATOES! I think they’re probably the favorite of 99.9% of gardeners, right?? Tomatoes from the store just can’t hold a candle to a fresh garden one. On that note, I’m going to give you all my tips and tricks for growing an abundance of tomatoes. I posted here about planting tomatoes and here about using eggshells to help grow fabulous tomatoes, but today I’m going to go a little more into the whole growing season. I’ll tell you all my mistakes over the years and what my favorite varieties are for my 6b zone. First things first- figure out what zone you are in. You can type in your zip code here to find out. 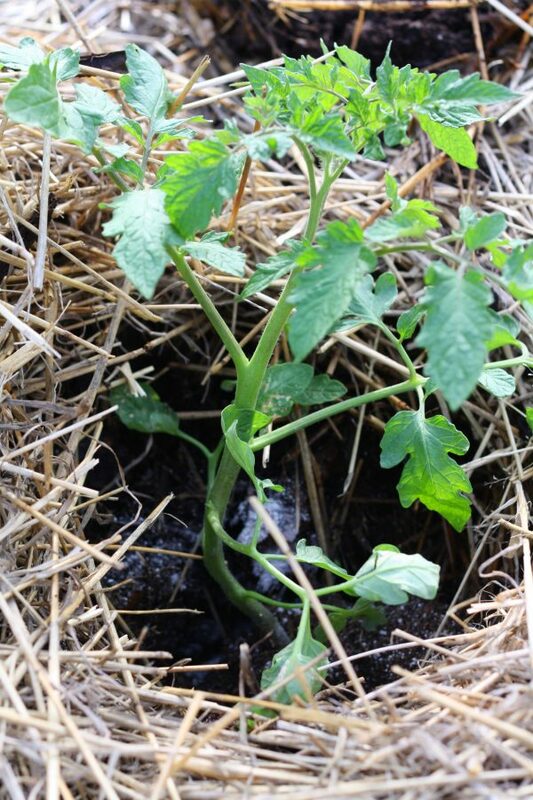 Most of you will probably have to use started plants in your garden, but there might be a few of you further south who can plant tomatoes by direct seeding. So, figure out what zone you’re in and then you’ll know what your options are. I looked and looked, but couldn’t find a definitive answer on when it’s safe to direct sow tomatoes. I know that you need to have a longer growing season than what we get here in zone 6b. I would say that zone 8 could definitely direct sow and maybe you zone 7 gardeners could also? Let me know the answer to that, will ya?? For those of us with a shorter seasons, we definitely have to transplant our tomatoes into the garden. You’ve got a couple options here. For greater variety options, starting your own seeds is the way to go Check out this post and this post for starting your own seeds!. The sky is the limit on what kind of tomatoes you can grow. And the color options- wow! You can have a whole rainbow of tomatoes! If seed starting isn’t your thing (or you are short on space! )- never fear! Pretty much any store out there that might carry anything to do with gardening will have tomato seedlings for you to buy. Any big box store and most grocery stores will have tomato plants available come spring. You can also find them at farm stores and local, small town stores. A word of caution about buying from a big box store- sometimes taking care of the plants isn’t high on the priority list, so the seedlings can get dry and stressed. Just be careful when buying. If the plant doesn’t look healthy- it’ll probably not grow to be your best producer. We are blessed in our little town (and by little- I mean population 1,200!) to have a wonderful local flower shop that always carries garden plants in the spring. The owner gets in a good variety and most years, I buy all my plants from her. Over the years, I have tried a plethora of varieties. I have started my own heirloom seeds and have bought plants from various stores around here. In my zone and climate, my go-to tomato variety is definitely Jetstar. It doesn’t matter what my weather does, this variety will always perform. And it doesn’t crack and holds on the vine longer. It’s perfect for fresh eating and putting on hamburgers, but it also lends itself well to making salsa and homemade tomato soup. It is considered a low acid tomato, though, so I add a little lemon juice to each jar of soup that I process to get my acidity up to safe canning levels. I also usually plant a couple Romas to add to my salsa, but I have made salsa batches that only had Jetstar tomatoes in them and they turned out well, too! I also love a good pear tomato. Whether they are yellow or red, they seem to be prolific producers! Let’s not forget about the cherry and grape tomatoes! I have planted heirloom varieties of these and have also bought plants that just said “cherry” on them as the variety name. They ALWAYS give me more tomatoes than we can eat! As far as heirlooms go, I haven’t grown every single option out there, but I’ve grown probably a dozen different kinds over the years. While I like them, I definitely feel like they are more sensitive to the climate nuances and are more prone to developing issues-whether disease related or pest related. And they don’t seem to last as long on the vine, so if you miss a couple days of picking, you will probably have a fair amount of rotting tomatoes to deal with. That being said- I’m not saying you should never plant the heirlooms! I always plant a couple different ones every year. I am saying that I would throw some tried and true hybrids in there to guarantee a plentiful harvest all the way around. The million dollar question, right?? I often find that many beginning gardeners over plant, but in their defense, it’s so easy to go overboard, lol! Guess how many I planted my first real gardening year….. Uh, yeah. You read that right. Granted, I started them all from seed and I thought I’d have an actual tomato farm and sell them at the farmers market. Let me tell you- that is called baptism by fire! I learned a lot, but the biggest lesson I learned was that I did not have time to care for 400 plants and take care of 3 little kids. After that year, I planted around 50 every year for years. And, every year, I struggled with caring for them all and my yields weren’t anything to write home about. So, 4 years ago, I did a major downsize to 9 plants. I took my sister’s advice and only grew Jetstars. If you only want enough for fresh eating, I would plant one regular tomato (some sort of beefsteak or larger round fruit type- like the Jetstar variety!) and one cherry or pear tomato plant. If you want enough to can a big batch of salsa, eat as many as you want fresh and be generous with the neighbors, I would plant 4 regular tomatoes, 1 Roma, and 1 cherry. You can see the progression now right? Now, I will say this- every gardening year will be different and you will run into new challenges every year. So, there could be a chance that you plant just 9 tomato plants (because that was more than enough the previous year) and then those 9 plants just can’t quite give you enough. But, this will hopefully give you a ballpark of where to begin. Just don’t be like me and get overly ambitious too quickly, lol! 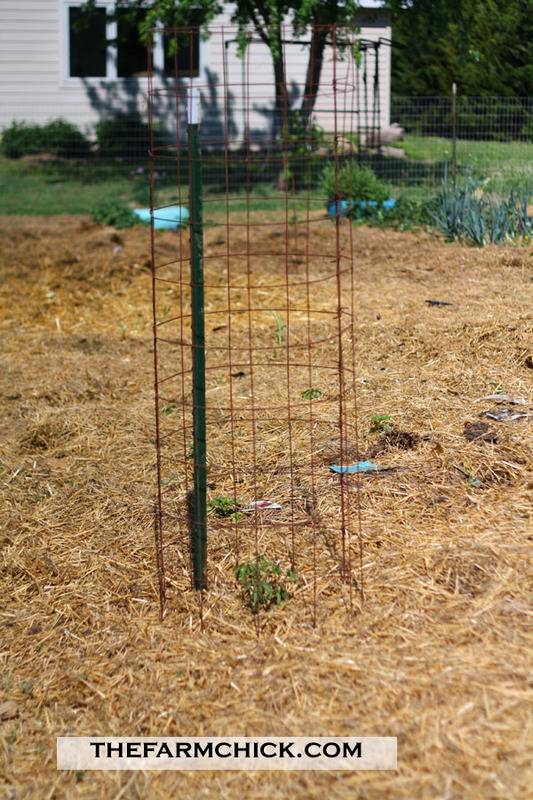 Last spring, I wrote a whole post on how I plant tomatoes, but I neglected to talk about spacing. Let me tell you, I have a whole lot to say about that, too! DO NOT PLANT THEM TOO CLOSE TOGETHER!! You can probably guess how I learned that, too! Most sources recommend spacing them about 4 feet a part. You want to be able to actually pick those amazing juicy tomatoes come harvest time and if you can’t get around to the entire plant, you’ll miss so much of the fruit! Now, last year, my tried and true plant spacing completely backfired on me. See, we ended up with a VERY wet, humid, and still July and August. It was completely out of character for Kansas! My tomatoes grew so huge they grew up over the top of my 5 ft tall cages and ended up intertwining with one another! You could walk through them AT ALL! I literally had to crawl on my hands and knees to get to those inside plants. Plus, because of the lack of wind, the abundance of moisture, and the monster plants- I ended up with a fungus that totally tanked my yields! It was crazy, folks. Crazy, I tell you! So, this year, I’m going to grow them in single lines and even some individual random spots to hopefully take care of that problem. More than likely, we won’t have another summer like last, but you never know and this way I’ll be prepared. There are basically 4 options for watering. 1- Don’t because you get enough rain. 2- Water over the top with a sprinkler of some type. 3- Water with a hose at the base of the plant. Last year was the first year that I didn’t have to water once! That was definitely the exception to the rule, though. My favorite way to water is to use a soaker hose. You minimize your chances of getting a fungus from wet leaves and you conserve your water. Plus, you don’t have to move a sprinkler or stand there holding a hose. That being said, you have to set up your soaker hose system at the same time that you cage them. Remember how I said your plants would get really big some day? Well, when that day comes, it’ll be too late to set up an effective soaker hose system because you won’t have enough room! The only time soaker hoses backfired on me was the year that I started using my fabulous tomato cages. I staked them in the ground with electric fence posts instead of t-posts. We didn’t have any extra t-posts at the time and I was too cheap to buy more. I figured that my garden was sheltered enough that they wouldn’t blow over anyway. Well, one of our typical Kansas summer thunderstorms rolled through about the time that my plants were 5 feet tall. And every single one blew over because they were so top heavy! This pulled up my soaker hose with them (because I had threaded the hose through my cages) and it broke the hose in multiple places. Lesson learned- stake those cages! This year I’m planning on using soaker hoses again. But, I will say this, I have gotten large yields using a sprinkler, too! So, whatever you have the time, expense and set up for- go with that. 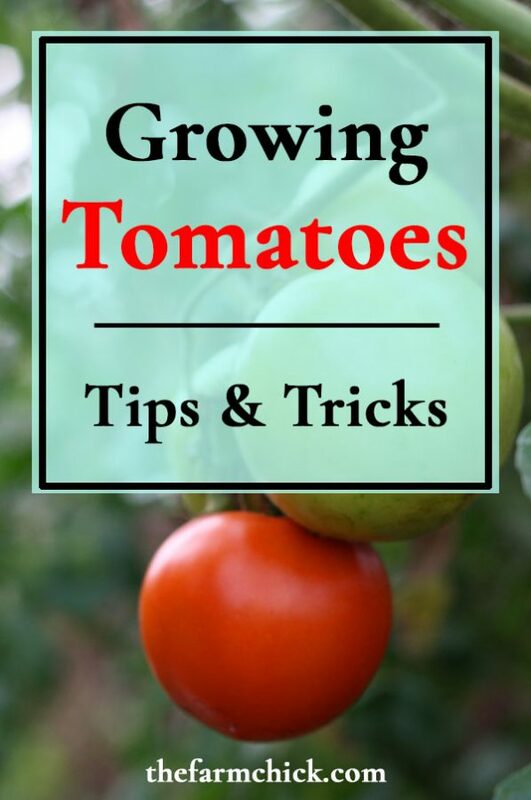 I have read A LOT about pruning your tomato plants. One year, committed myself to pruning those sucker branches to see if it really increased my yields the way everyone says it does. Honestly, I saw no noticeable difference. I decided that it was not worth my time, so I don’t bother pruning now and I still get huge yields. So, I’ve talked a bit about fungus issues, but haven’t mentioned insect pests. Every garden is different. My sister gardens 7 miles east of me, also in zone 6b. She has a horrible problem with horn worms every year. I, on the other hand, have never seen a horn worm on my tomato plants! I usually have a problem with blister beetles. They will eat the leaves and they really like a nice, ripe tomato! I don’t like to use chemicals on my plants so I usually just don’t worry about it and make sure to pick my tomatoes before the beetles can get to them. There are organic sprays available, or some gardeners recommend planting calendula as a trap crop. Your insect pressures are going to be somewhat regional, based on the ecology in your area, so I won’t go into every possible pest out there! My general piece of advice here is to talk to other gardeners in your area and find out what issues they’ve had and how they handled it. Then see what happens in your own tomato garden. 1- Plant varieties matter. 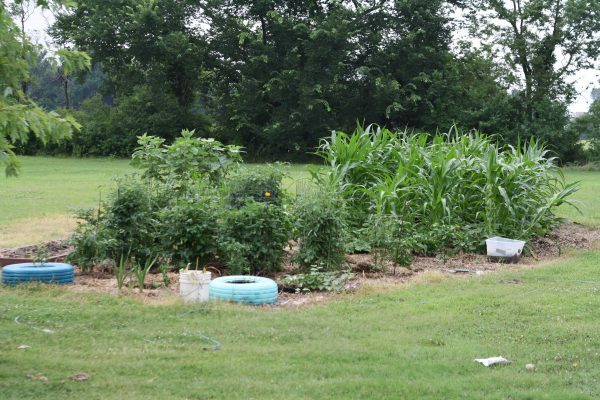 Plant a mix of heirlooms and hybrids. 2- Decide what you want to do with all of your tomatoes, then buy the number of plants in accordance with that. 3- Make sure to space those plants out! 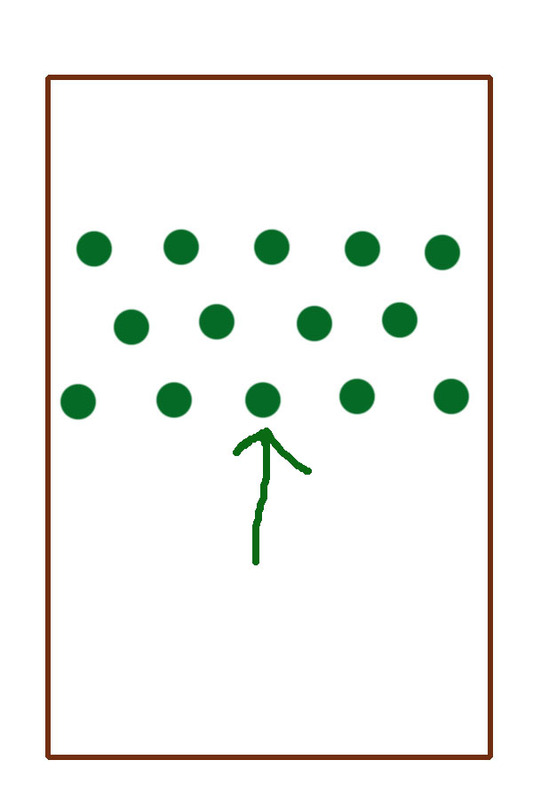 4- Decide what watering system you’d like to use and get it set up at the same time you cage your plants. 5- You can prune if you want, but I personally haven’t been able to tell a difference in yield, so feel free to skip that maintenance step during your growing season. 6- Talk to other gardeners about possible pest pressure in your area, but wait to see what actually happens in your own garden. Give me all of your tomato growing tips and tricks!! What works in your zone? ?